DETROIT (Reuters) - Detroit, saddled with $18 billion in debt, has filed for bankruptcy. Crime is rampant, and the city cannot provide its depleted population with basic services. So why would anyone want to run for mayor, especially when a state-appointed emergency manager has all the power anyway? "That's a question I get asked all the time, because some people do wonder why they (the candidates) would want the job," said Bill Ballenger, publisher of Inside Michigan Politics. "But there is an opportunity here to achieve things that no mayor has been able to do for the past 30 years." For at least that long, the city's political class has mostly failed to address the city's ever-expanding fiscal problems. Corruption has dogged Detroit, especially under former mayor Kwame Kilpatrick, who was sentenced to 28 years in prison last month after a series of scandals that left the city worse off. Detroit's voters go to the polls on Tuesday and face a choice between Mike Duggan, a former chief executive of a Detroit hospital, and Wayne County Sheriff Benny Napoleon. 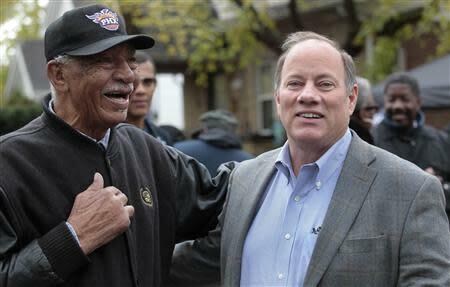 Duggan is widely expected to win, which would make him Detroit's first white mayor since 1974. But whoever prevails will take office under Kevyn Orr, the emergency manager appointed in March by Michigan's Republican governor, Rick Snyder, to tackle Detroit's fiscal crisis. Orr's sweeping powers allow him to reverse most actions taken by the mayor and city council. As a result, Mayor Dave Bing and the current council have become mostly bystanders to Detroit's turnaround effort, including the July bankruptcy filing, the largest Chapter 9 municipal filing in U.S. history. The next mayor will also have little power at the beginning of his four-year term, but that could change next September, when Orr's tenure is slated to end. When the bankruptcy process is completed and an emergency manager is no longer in place, the person elected could find himself at the controls of a city with its finances restructured and a true chance to lead the city. "There will still be tough decisions to be made and the mayor would still need to fix Detroit's neighborhoods" after Orr's departure, said Sandy Baruah, chief executive of the Detroit Regional Chamber of Commerce. "But I can't imagine the new mayor wouldn't rather inherit a city with the books balanced and where some of the tough decisions have already been made." Others argue that the mayor could have significant influence from Day One. A proactive mayor with a clear plan and a willingness to cooperate with Orr could influence the emergency manager's decisions. The two mayoral candidates have shown little disagreement on the major issues facing the city. But they have diverged broadly on how the new mayor should deal with Orr. Duggan, who is running on a track record as a turnaround specialist, has said he would engage with Orr while trying to persuade the governor to curtail the emergency manager's tenure. "I'm going to try to convince the governor to do one of two things: either shorten the tenure or turn over operational control of the city to the elected mayor and the team at the earliest possible date," he told Reuters. Napoleon has said he would not work with the emergency manager, in part because Orr has shown no tendency to cooperate. Even so, he agrees that Detroit may have a "once-in-several-centuries opportunity" to reinvent itself without its crippling amount of debt if it goes into bankruptcy. "When you have a clean slate you become the architect, you become the painter, you become the artist, and you get a chance to do some creative things that haven't been done before." Political consultant Eric Foster of Troy, Michigan-based Foster McCollum White & Associates said the "smart play" for the new mayor is to help assure there is a restructuring plan "ready to implement." "If you don't work with the emergency manager, then none of the decisions will reflect what you want," Foster said. 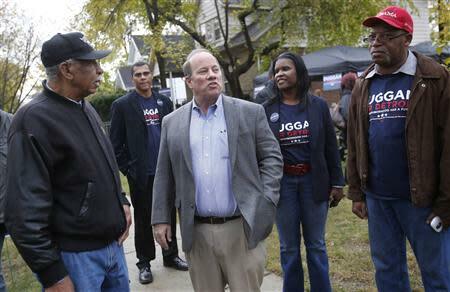 Duggan's message seems to be gaining traction. Despite being a write-in candidate - he did not meet residency requirements because he had not lived in Detroit long enough - Duggan won the August 6 primary by a large margin and has consistently held strong leads over Napoleon in polling leading up to the election. Once the envy of the world for its automotive prowess and role as the "Arsenal of Democracy" during World War Two, Detroit has declined for decades, with a population of 700,000 in 2010, down from a peak of 1.8 million in the 1950s. As jobs and people moved away - especially Detroit's white population, much of which migrated to the suburbs - the city's tax base eroded. Declining investments in basic services like streetlights, police, fire and emergency services have only compounded the problems faced by residents. The two candidates, both Democrats, say they have plans to revitalize Detroit's neighborhoods and tackle blight, including some 78,000 abandoned structures, nearly half of which are considered dangerous. Access to quality education and jobs for much of the 80 percent-black population is a persistent problem. Napoleon has championed a One Square Mile Initiative that would assign a police officer for every square mile of the city. He has promised a 50 percent reduction in crime by the end of his first term. 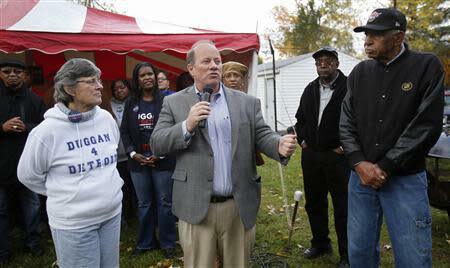 Duggan has said he would create a Department of Neighborhoods to consolidate public safety and blight-removal efforts. He also has said he would reinstate a program from his time as Wayne County prosecutor where he would seize abandoned homes and sell them to new owners who would occupy them. An economic boomlet is now under way in Detroit and could signal a turnaround that might benefit the new mayor at some point. Online mortgage provider Quicken Loans has moved 7,000 employees and invested $1 billion downtown, and Blue Cross Blue Shield of Michigan has added thousands more. Small tech companies are sprouting, and a proposed $140 million light-rail line, if built, would create jobs. The big question for the next mayor is how to boost the economy in neighborhoods beyond downtown and midtown. Still, political consultant Steve Hood says Detroit now "represents a great challenge, but also a great opportunity," with a waterfront ripe for development and large tracts of vacant land. Lauren Bigelow, CEO of Ann Arbor-based Growth Capital Networks, which promotes programs to connect startups with venture capital, said that most mayors can merely make "incremental changes," but Detroit represents a chance for a turnaround along the lines of what Rudy Giuliani experienced in the early 1990s as the new mayor of New York. "Giuliani moved the needle significantly and, love him or hate him, he had an impact that's indelible," Bigelow said. "Whoever wins the election has that opportunity and that's really rare."